One year on, the U.S. government is partially shut and the market ebullience that greeted the president’s corporate tax overhaul is a distant memory. In the 12 months since he visited the World Economic Forum in the Swiss Alps, Trump has launched a trade war with China, slapped tariffs on Europe, weighed in on Prime Minister Theresa May’s Brexit deal, expressed understanding for France’s “Yellow Vest” protests against President Emmanuel Macron and threatened to “devastate” Turkey’s economy. That unpredictable stance toward traditional U.S. allies and rivals alike fans geopolitical risk and ensures that Trump’s policy choices will be the talk of the retreat, even as the president skips the forum to focus on the shutdown. Faced with that reality, world leaders are increasingly falling into one of three camps in their approach to the president, according to Stephen Walt, a professor of international affairs at Harvard University: following Trump’s lead, resistance -- however futile -- and trying to make the most of his policy vagaries. Yet lacking any consensus against Trump, Walt sees many leaders as engaged in a waiting game to try and sit him out. Leaders from all three camps will be present in Davos: those from traditional U.S. allies such as Canada and Germany who are resisting as far as possible in the hope they can wait Trump out; rivals from China and Russia who thought they could exploit the opportunities but have found him too erratic; and those in countries like Israel, Hungary and Brazil who have benefited from the environment around Trump’s rise. Among the forum’s headline attractions is German Chancellor Angela Merkel, who can be expected to build on her New Year’s address denouncing nationalism and populism that reinforced her status as a Trump adversary. Yet she and Macron were unable to prevent Trump from quitting the Iran nuclear deal or the Paris climate accord. Germany is in the firing line if he follows through on his threat to impose punitive tariffs on imported cars. 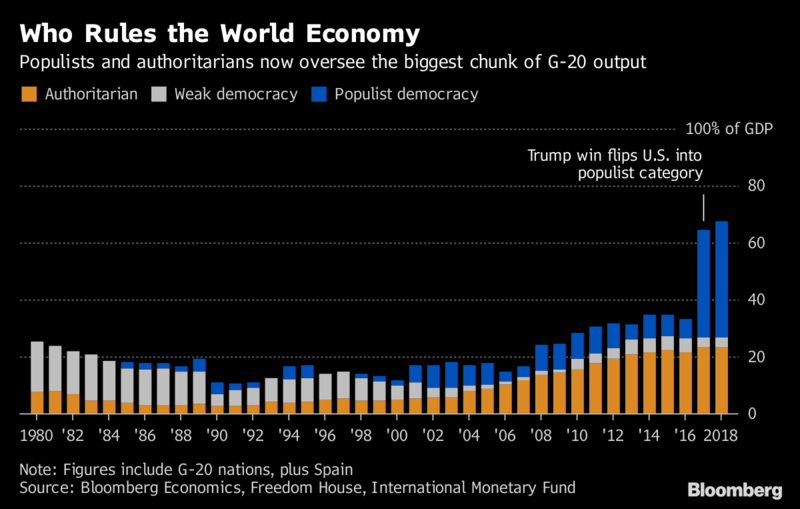 Trump’s attacks on allies and persistent questioning of the value of the transatlantic alliance have accelerated European efforts to gain greater autonomy, including moves to boost the role of the euro and reduce dependence on the U.S. dollar. Until that happens, however, allies in Europe remain vulnerable, said Erik Brattberg, director of the Europe Program and a fellow at the Carnegie Endowment for International Peace in Washington. Then there are swathes of the globe whose leaders are emboldened by Trump. Israel’s Prime Minister Benjamin Netanyahu, who benefited from the U.S. decision to move the American embassy from Tel Aviv to Jerusalem, will be in Davos, as will Italy’s prime minister, Giuseppe Conte, whose populist coalition government shares Trump’s hard line on migration. Also in town will be new Brazilian President Jair Bolsonaro, the leader of Latin America’s largest nation, dubbed by some the Latin Trump. From the right to bear arms to a disdain for multilateralism, the ideological ties run deep. In Davos, Bolsonaro wants to present Brazil as reinvigorated with a more open economy; his team plans to lay out priorities including privatizations and lower taxes. 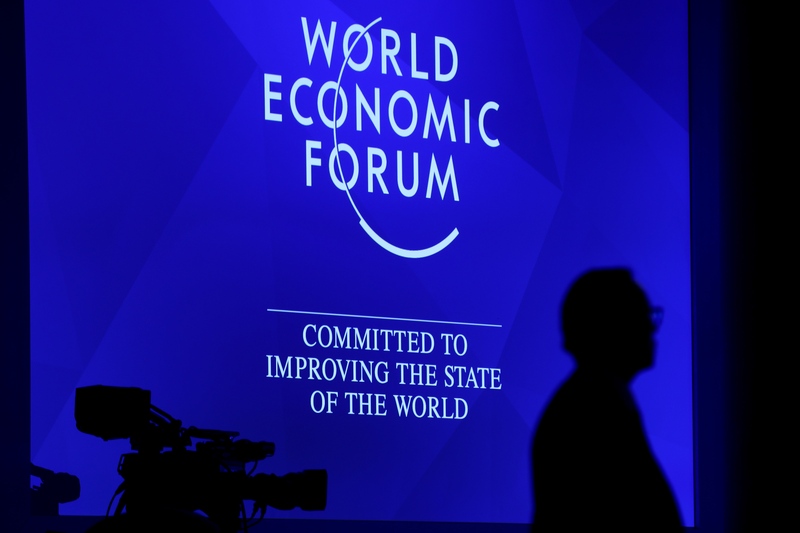 Which issue should matter most for leaders at the World Economic Forum? China’s delegation to Davos this year is led by Vice President Wang Qishan. Trump’s decision last week to pull the whole U.S. government delegation means Wang won’t get to meet with Treasury Secretary Steve Mnuchin and discuss the trade conflict. For all his bluster, diplomats point to the fact that Trump has not radically altered the American-led web of alliances. He renegotiated trade deals with Canada, Mexico and South Korea that left much of the substance intact, and his complaints about Europe’s defense spending, China’s trade practices and Iran’s regional role could have been championed by other Republican presidents. Yet for Russia, Trump’s unpredictability has led to worsening ties. The president’s abrupt cancellation of an expected meeting with Vladimir Putin at the Group of 20 summit in Argentina last year -- the third such snub for the Russian leader in 12 months -- was the last straw, with Russian government officials lamenting that the president’s aides are playing him as they like. --With assistance from Henry Meyer, Ilya Arkhipov, Raymond Colitt, Peter Martin, Dandan Li and Zoe Schneeweiss.